A record 19 teams entered the 2015 Dollar Cup, one of the popular series of HPA tournaments held annually at Cowdray Park, with Ludo Ephson’s Poulton Balvanera beating George Pearson’s Conosco in the final. Playing alongside Ephson (one goal) for Poulton Balvanera were Juan Jose De Alba (two goals) at No2, Australian Lochie Hunter (four goals) at three and five-goaler Tomas Iriarte at back. George Pearson took the No2 position for Conosco with Josh Cork (0) at the front door and five-goalers Will Emerson and Peter Webb at No3 and back respectively. Conosco took a resounding lead in the first chukka with Webb and Emerson contributing four goals between them to Lochie Hunter’s single goal for Poulton Balvanera. The second chukka saw Poulton Balvanera find their feet. Their first goal of the chukka came from a 30-yard penalty taken by Hunter but it wasn’t too long before a pass to Iriate saw the back fight off two Conosco players and dribble the ball between the posts to pull back another goal. However, Pearson and Webb gave Emerson the space to steer the ball to Poulton Balvanera’s goal and Conosco were ahead 5-3 at the close of chukka two. The 2015 Dollar Cup was all over when Tomas Iriarte sent through goal number 15. After half-time, the goals dried up for Conosco. A handy pass from Iriate to Hunter, in turn received by JJ De Alba, saw the young No2 slot a lovely bankhand shot through the goal posts and a foul enabled Lochie Hunter to make it 5-5. With everything to play for in chukka four, Iriate made the first goal taking Poulton Balvanera ahead for the first time in the match. Keeping up the pressure, Hunter raced down the pitch and his classy goal took the score on to 7-5 in Poulton Balvanera’s favour. With three minutes to go, Emerson was fouled and Peter Webb sent a solid 40-yard shot through the posts. An attempt at goal by Iriarte failed and Webb sent up a huge shot from the back line. He charged forward, re-captured the ball and hit a splendid shot to even the scores at 7-7. JJ De Alba took off with the ball from the throw-in and passed to Iriarte, but a melee in front of the goal resulted in a whistle and a spot hit to Paulton Balvanera. The 2015 Dollar Cup was all over when Tomas Iriarte sent through goal number 15 to win the trophy 8-7 for Poulton Balvanera. The cup was presented by the Hon Lila Pearson and prizes were sponsored by Casablanca Polo. 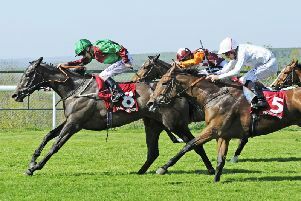 Wilf Fine’s Las Estrellas side met Parke Bradley’s Silver Fox in the final of the six-goal Jubilee Cup at Cowdray Park. Fine Jnr was joined by father Ray Fine, both playing off minus one, giving them scope to add three-goal player Tomas Beresford and five-goaler Tomas Garbarini Islas into the middle order of the team. Parke Bradley’s side included Ollie Cork (no goals) at No2, John Martin (three) at No3 and four-goaler Henry Fisher at back. Silver Fox captain Henry Fisher was first to make a mark on the scoreboard with a lovely field goal but retaliation was swift with Garbarini racing away from the line-out and equalising for Las Estellas. Chukka two saw Garbarini first to score for Las Estrellas and Ollie Cork picking up a ball from Fisher to roll the ball through the posts and equalize for Silver Fox. A nifty backhand shot from Beresford took Las Estrellas into the lead and by the end of the chukka a super crop of goals had taken Las Estrellas into a 5-3 lead by half-time. Tommy Beresford was first to get his stick to the ball at the start of chukka three but lost it to Fisher. Suddenly Garbarini was in the mix and escaped the pack to score again for Las Estrellas, who led 6-3. Within seconds the yellow shirts had the ball again and Beresford snatched another goal. There was no let-up in the pressure from Silver Fox, with John Martin and Henry Fisher playing hard and pushing for goals, finally to be rewarded with one late in the chukka to reduce Las Estrellas’ lead to 7-4. The final chukka surprisingly saw no goals for Las Estrellas, despite the best efforts of Beresford and Garbarini. A mistake by Wilf Fine gave away a penalty and John Martin was able to score from 30 yards. Martin saved a shot at goal from Beresford and Garbarini cleared the ball as Cork was attempting a goal for Silver Fox. Fisher tapped the ball forward from a penalty hit and was ridden off by Garbarini, but Martin was waiting and passed to Fisher, who carried it through the posts for 7-6. But time ran out for Silver Fox and Las Estrellas remained ahead. Caroline Bradley presented the Jubilee Cup and prizes.